Combine rice and 4 cups of hot water in casserole dish and place in microwave on high for 15 minutes. Open cans of chicken & asparagus and drain; pour into bowl. Combine butter or margarine with salt, pepper, dry mustard, onion powder and flour in skillet and stir as margarine melts -- consistency will be lumpy. Add whipping cream a little at a time. Stir until this mixture comes to a boil and whipping cream becomes thick like gravy. Turn off and set aside. When rice is done, pour into greased casserole dish. Crumble chicken over rice, line up asparagus spears on top and then pour whipping cream mixture over top. 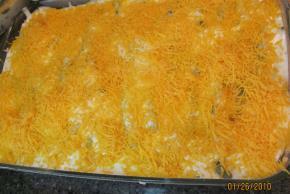 Last, cover top of casserole with shredded cheese and bake at 350°F for approximately 40 minutes or until cheese is melted on top.